Take a look at some of the hottest ‘gayborhoods’ on offer when planning your relocation. Moving to London and finding the perfect pad is not just about choosing an apartment close to work, it’s also about finding a neighborhood that suits your lifestyle so that you can get out and enjoy your new London life. From the boho chic of Hampstead to the heady delights of Vauxhall, there are literally dozens of gay-friendly neighborhoods in LGBT London, many with an active gay ‘scene’, if that’s even a ‘thing’ anymore! Soho is still considered one of the original gay neighborhoods in London, but its rapid commercialization over the past few years has meant that it’s not necessarily a great choice to rent an apartment. Also… Tourists, and now that you’re living in London, you’ll be like the rest of us and avoid the crowds as much as possible. Hampstead is a great choice, or even neighboring Kilburn if a Hampstead rental price tag is out of the question. Though not a traditionally gay entertainment area, it has a real community feel to it and is one of London’s friendliest neighborhoods. I’d add Clapham to the mix as a top choice for a friendly neighborhood, upwardly mobile and definitely up and coming! 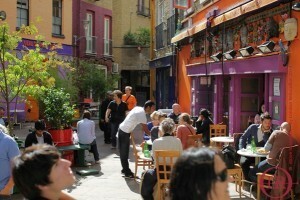 Shoreditch remains a firm favorite in the LGBT community because of its thriving design, art, and alternative clubbing scene. Rents though remain quite high. This would definitely be at the top of my list for single professionals moving to London. Bermondsey is an interesting choice, it’s very much on the list of neighborhoods for professionals, but it doesn’t have the nightlife…Not yet anyway. If you’re looking for something that’s going to be THE gayborhood in London in the next couple of years: Tooting and Peckham get my vote. Nightlife, village life and community spirit, as well as art, culture and a burgeoning foodie scene. You heard it here, first – thank me later! We shouldn’t even have to have this conversation, but the sad reality is that sometimes it can be harder to find a private rental, even in our modern, fully integrated society. At London Relocation we ensure that choosing your new home in London only ever a matter of choosing the right home for you – there is no other factor.